2018 was a year that set many precedents for future seasons. With the decision to go to Midwest Regionals came new experiences that opened our team’s eyes to the possibility of future out-of-region competitions. Also, a decision was made later in the season to allow freshmen to apply for the team. This way, students can build lasting bonds with fellow team members and leaders before their time with the team comes to a close. Throughout the season, our team did amazingly, receiving several finalist positions and awards. 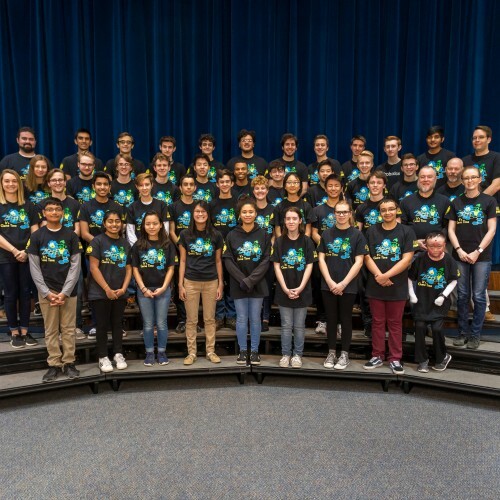 Of these awards, the most notable was the Engineering Inspiration Award at Midwest Regionals-a prestigious award given to teams that exemplify both a strong robot design as well as continual outreach within their community. Such achievements motivated team members to carry over the strong performance into off-season competitions, being finalists in both Duel on the Delaware and Brunswick Eruption. Overall, 2018 was a year of successes and improvements that will hopefully lead to great performance in the future. 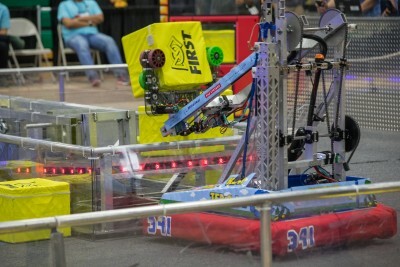 This year’s FIRST Robotics Competition game for the 2018 season is FIRST POWER UP. It involves two alliances of three teams each, with each team controlling a robot and performing specific tasks on a field to score points. The game has a retro 8-bit theme and teams are required to place milk crates, or “power cubes”, on large balancing scales to tip the scale and gain ownership. Alliances can also trade power cubes for power ups, giving them a temporary advantage in a match. At the end of the match, robots can climb the tower attached to the center balancing scale using a rung attached to the tower, giving them additional points.